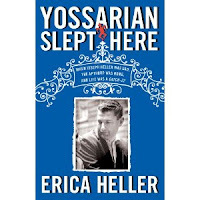 In a bottom-line world where under-researched overstatement is the norm, Erica Heller’s unputdownable new memoir, Yossarian Slept Here: When Joseph Heller was Dad, the Apthorp was Home, and Life was a Catch-22, seems revolutionary. It quietly distills a lifetime, and the life of Heller’s perplexing, high-octane family. Upon returning she kisses the sidewalk on Broadway. Given the literary qualities of Yossarian, the younger Heller may well earn celebrity status in her own right, joining the Apthorp’s roster of Great and Good. As the book’s title and subtitle suggest, this is a hybrid. 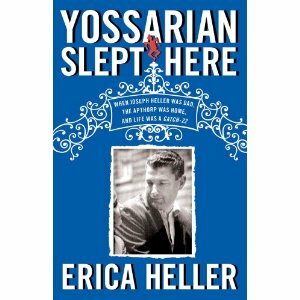 A biopsy of the building, its history and residents, the real focus of Yossarian is Joseph Heller and his long-suffering wife Shirley, Erica’s mother. Erica plays a supporting role in the Hellers’ Bermuda Triangle; her younger brother Ted makes cameo apparences and remains an enigma. The bittersweet tale of this over-achieving, angst-ridden family’s rise in postwar Manhattan, its wrangling and tragicomic fall, is at turns laugh-aloud funny, brilliantly observed, somber, obsessive and depressing. If it were a movie, it could be co-directed by Mel Brooks and Alfred Hitchcock. What keeps you turning the pages deep into the night is Erica’s skill at spinning the yarn. In her hands, the Heller family’s self-lacerating irony and wit is eau de vie, sending down a variety of horse pills. Do not be daunted by the title: Yossarian might well win a National Book Award for the most cryptic, insiderish tag of 2011. Think Napoleon or Lord Byron, who famously slept everywhere. Then recall that Yossarian was Joe Heller’s doppelganger, the heroic antihero of Catch-22. Before it became one of the most frequently misused expressions in modern English, Catch-22 was a bombshell novel about the random craziness of World War Two, among other things. It was published in 1961. If you missed the novel, you might remember the movie (1970). If you missed both, you are fortunate: read and view them now. They may well change your life, and also entice you to read Erica Heller’s memoir. Both it and Catch-22 are bleakly hilarious. Yossarian is a testament to the destructiveness of narcissism; Catch-22 was deeply, riotious anti-war and joyously absurdist. The right book at the right time in the right place, as the 1960s progressed, Catch-22 became the literary talisman of anti-Vietnam youth. It sold millions, and is still in print. Catch-22 certainly shaped the outlook of this reader. Like many of my generation I devoured it when I was attending high school. Might Joseph Heller be indirectly responsible for this blog? It would be impossible to calculate how many lives were shaped—in some cases warped—by Joseph Heller. He was much more than a consummate stylist. His world-view seemed to my adolescent mind to merge with a peculiarly American genius Dostoevsky, Conrad and Camus. His descriptions of World War Two also rang true: my father had fought in Italy in the same places as Yossarian-Heller, in eerily similar circumstances. Curiously, Erica Heller reveals in this memoir that she has never read Catch-22. Whether she inherited her knack for pithy prose from her father is impossible to know without genetic testing and exhumation. They were both advertising copywriters and shared a mordant, irreverent, at times sardonic wit. Genetic science may one day tell us whether talent may be transmitted down the generations. More likely, Erica Heller’s skill and her personality were branded and bruised by the hammering and fire of her father’s forge. His was a relentless demand for perfection. Complex and troubling, Joseph Heller was clearly not your run-of-the-paternal-mill presence in the lives of his wife and children. Charm and literary skills aside, what comes through when reading this self-effacing and at times self-depricating story is that Erica was spared the genes carrying her father’s less admirable traits. To her credit, she forgave him more than once for emotional injury, and out of her experience has crafted a heartfelt, moving memoir. Glasnost-and-Sunshine Department: Erica Heller is a close friend of mine. We met thanks to her attachment to Paris, a city her mother loved, and into whose bosom—into the Seine, to be precise—her ashes were eventually scattered. In 2005 a mutual friend gave Erica a copy of the first edition of Paris, Paris: Journey into the City of Light. She was enthusiastic enough to become one of the book’s greatest boosters. We have since then exchanged thousands of emails, spoken on the telephone many times, and seen each other in New York at the Apthorp and elsewhere. My wife Alison Harris is part of this affectionate triangle, and took the portrait of Erica shown here. Anyone troubled by my methodology should consider my review a testimonial or extended blurb.